"Maintain my water heater? Oh no!" you may be thinking. "Another chore to add to my list." Don't worry, though. Water heater maintenance is quick and easy and will keep your heater running efficiently, prolong its life, and ensure comfortable showers all winter long. Take an hour or so to do it once a year -- the end of daylight saving time is an excellent reminder. Start by reading the instruction booklet that came with your water heater purchase or look up the directions for your particular model online. Then follow these simple steps. ESSENTIAL: Switch off the electricity or the gas line and the cold water supply. Protect your hands with work gloves. Test the temperature pressure relief (TPR) valve. Pull up the handle of the temperature pressure relief valve -- located near the top of your water heater tank -- very carefully to avoid scalds from heated water. You're checking to see whether hot water will run out of the overflow pipe and stop when you let go of the handle. If no hot water appears, or if it doesn’t stop when the handle is released, the valve needs replacement. Inspect the anode rod. Also known as the sacrificial anode, this metal rod is "sacrificed" by attracting corrosive elements from the water that enters the heater, sparing the tank itself. The anode starts out life 3/4" thick and usually lasts for 2-4 years. When it has corroded to less than 1/2", is coated with a calcium deposit, or has exposed more than 6" of the steel wire at its core, you'll know that you need to get a new one. Flush the tank. Allow the water to cool somewhat to minimize the risk of injury. Attach a hose (in good condition, please, so it won't leak the water all over your floor) to the tank spigot and position the other end of the hose in your floor drain, a large tub, or out into your yard via a window or door. Drain the tank. Then clear out any mineral sediment, dirt, and other debris which has collected on the bottom of the tank by opening the cold-water valve for a few seconds, draining, and repeating until the water comes out clean. This will make your heater work more efficiently and quietly. When you're finished, detach the hose. Be sure to refill the tank before reconnecting the power so that you don't burn out the heating element. Protect against scalds. In a household with young children or individuals with sensory impairment, accidental scalding from overly hot water is a serious risk. There is a debate over whether to adjust the water heater temperature down to 120 degrees -- which also saves energy, but can foster the growth of disease-causing organisms -- or to install an anti-scald device. Insulate. Maintain your water heater by wrapping in an insulating blanket to conserve heat after consulting the manufacturer's instructions to make sure that this is safe for your model -- or even necessary (most newer heaters are factory-insulated). Coat both hot and cold water pipes with foam pipe insulation, to maintain the temperature of the hot water and to prevent condensation on the outside of cold pipes in summer. Take care of leaks. Use a flashlight to inspect the area under your water heater. Water on the floor may be a sign that the tank is starting to corrode. Check out the valves, connections, and water lines while you're at it. 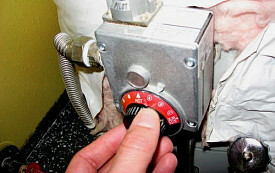 Consult a licensed plumber to see whether repair or replacement of your water heater will be required.